The always popular Ford Focus sets the standards for what's expected of a compact car with over 100 million models sold to date. It sports a distinct look, complemented by the signature Ford trapezoid grille, and comes in an electric variant as well as a hatchback ST model, opening up the nameplate to a variety of buyers. For 2014 models, Ford took some suggestions from its fanbase and integrated a new package and transmission option on select models. 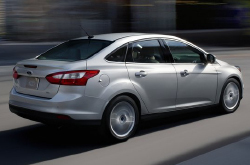 The Focus also sports an impressive powertrain lineup equipped with fuel-efficient engines. 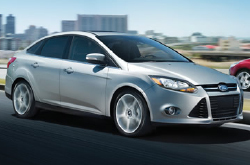 Read on for more details on the 2014 Ford Focus in Phoenix, then continue below for additional information on its specifications. A brand that puts emphasis on buyer satisfaction, Ford listened to the wants and needs of its clientele and have added a few new features to the 2014 Focus. The Sport Appearance Package is now being offered on SE models, which includes sport cloth seats, leather-wrapped steering wheel/shift knob and a rear spoiler to further enhance the car's athletic build. On Titanium, a manual transmission is available along with the PowerShift automatic, giving drivers more control over the vehicle. Additionally, the Focus is outfitted with active park assist and SYNC with MyFord, a smartphone-capable infotainment system with high-tech functions such as hands-free calling, voice-activated music search, navigation, audible text messaging and Bluetooth connectivity. Receiving high EPA estimates, the Focus offers three fuel-efficient powertrains. Two 2.0L four-cylinder engines are available with either a five speed manual or six-speed Powershift automatic transmission and deliver 160 horsepower and 146 lb.-ft. of torque. The third 2.0L four-cylinder is paired with the six-speed Powershift automatic SFE Package and displays the best EPA ratings of the bunch. Praised by many 2014 Ford Focus reviews, the Focus Electric, one of the most-fuel efficient cars in America, accelerates up to 84 mph and can travel 76 miles on one charge, making it a perfect choice for commuters who want to avoid the pumps. Compare Ford's most current model of the Focus to its rivals and we're more than confident that you'll choose it over vehicles like the 2014 Hyundai Elantra, Honda Civic, Chevrolet Cruze and the Mazda 3. Just a few of the characteristics that shoppers in AZ will enjoy are the Focus 's exquisite looks and cut-rate cost. Hundreds of Phoenix Ford drivers choose it because it's a truly amazing value; just compare its price to the competition. Take a peek at our bullets for more details about what it offers! We've taken the time to create reviews about vehicles like the 2014 Ford Focus because we know how important it is to your car search. It's rare to find hard facts about a multitude of cars in one spot. That's why it's OUR duty to offer reviews from seasoned auto critics, so you have access to these information sources on one site. The above article is stuffed with practical data - it contains info about fuel economy and other specs so that you can make educated decisions about the Ford you want to buy. 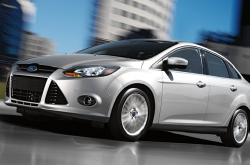 Thank you for reading Peoria Ford's 2014 Focus review. Now that you know more about the Focus , get in touch with us to learn about financing offers and OEM specials that can help you save big on your purchase.